This week for Sunday Supper we are celebrating Earth Day with a picnic hosted by T.R. of Gluten Free Crumbley. I love picnics. I love being outside and spending time with family and friends. I love spending a leisurely Sunday, visiting, playing badminton or croquet, snacking, grilling and perhaps having a glass of wine.....Ahhhhhh.....wine. I think that the perfect wine for a casual picnic pot luck, where you aren't sure what food will be offered and what the other guests wine preferences might be, is a fruity, refreshing Sangria Punch. This recipe I'm sharing with you today is sure to please everyone at the table with it's light and sparkly goodness. Sangria is very refreshing indeed, Wendy! I don't think I'd have time for it to get warm because it would be gone in a hurry. Well I was thinking more about what was in the pitcher not my glass LOL....the wine in my glass never lasts long either Stacy. I love a sangria in the summer, perfect cocktail, so delicious!! Sangria means summer is on its way! Sangria's always the perfect cocktail for a party! I am a wine lover but when it is really hot I find Sangria refreshing. Sangria is great for a picnic. What kind of red wine do you recommend using? I used a cabernet for this because that was what I had in the house. I like to use a dry red so that it cuts the sweetness of the soda. Some like to use a rose but I find that is too sweet for my taste. 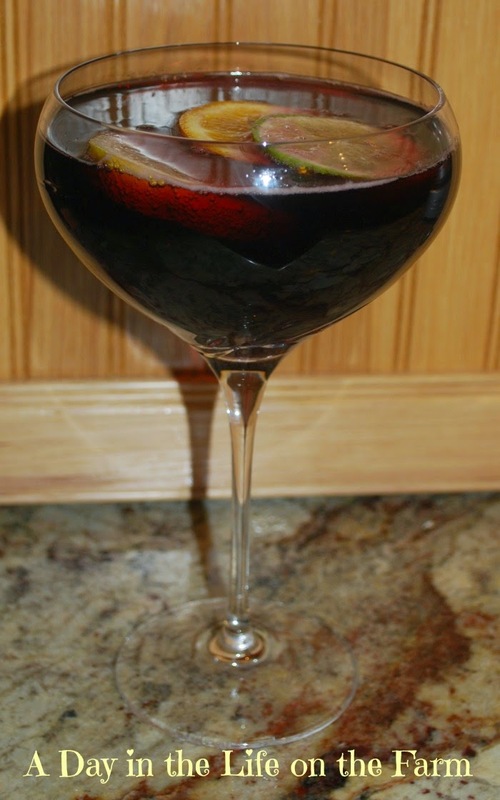 My family would love to see this sangria at the next picnic! I hope that you make them very happy Lauren. This is just brilliant! I sometimes freeze grapes and use them but this is even better! Thanks Tammi, grapes are a great idea too. I love sangria!! And that glass looks wonderful! It was Paula and isn't it a gorgeous glass. I got 2 as Christmas gifts last year. Oooo wonderful idea to put a cherry inside the wine ice cube, Wendy. Your sangria at a picnic would definitely get the attendees doing a happy dance! It had me doing the happy dance, that's for sure.